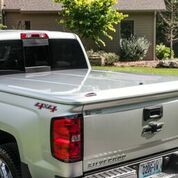 Painted to match Solid Tonneau Cover with a low profile look to the cover that goes unmatched by any fiberglass lid. Not only is it half the weight of a fiberglass cover, but you can also get your LUX in half the time. Have your LUX cover in days, not weeks.